Mary has spent four years of high school as a nerdy good girl. Mary's last hope to do something memorable in high school is to win the Oyster Point High Unofficial Senior Week Scavenger Hunt. After a fiasco at prom and losing her spot at Georgetown to a football jock, she is determined to take first place. She cobbles together a squadron of her best friends in a race against the clock to chase down clues and strange objects sent via text. All throughout the race, Mary must confront her best friend Patrick’s raging crush and the feelings that she can’t quite return along with her own unrequited love for bad boy Carson. With the finish line in sight, Mary has to decide what's more important—her friends or winning. 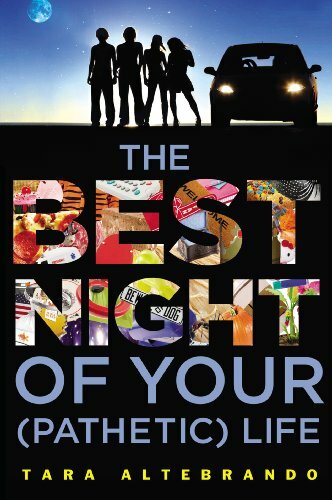 The Best Night of Your (Pathetic) Life is an angsty humor laden rollercoaster that will have readers laughing at every turn. With each emotional turn and setback, Mary dishes out quick-witted commentary tinged with sarcasm. At times it is difficult to sympathize with Mary, but ultimately this keeps her human – and you’ll like her in spite of her flaws. Many flashbacks explain the events leading to the night in the book, while the issues the characters deal with fill in gaps. “The NCAA is making money off the backs of students who are being told in a contract that they are going to play their sport and get an education. But the contract is false. They may have a degree when they leave school, but they are not getting an education”. As the NCAA Basketball Tournament kicks off and “March Madness” sweeps the nation (while some of us eagerly await Opening Day), an antitrust, class-action lawsuit against the NCAA continues its progression through the court system, with recent news that several current athletes have added their names to the lawsuit as well. Schooled: The Price of College Sports is a new documentary based on an e-book entitled “The Cartel” by Pulitzer Prize winning historian Taylor Branch (who also wrote an article for The Atlantic entitled “The Shame of College Sports”) and narrated by Sam Rockwell. The film examines the current economic environment of major college athletics, including the powerful role played by the NCAA and how that has impacted the rights of “student-athletes”. In short, it is an intimate look into the inner workings of what is now a $12,000,000,000 (yes, that’s billion) dollar-a-year industry. The film does an excellent job of outlining the history and development of the NCAA, which, as a result of a match-fixing scandal involving the Univ. of Kentucky's Men’s Basketball Team in 1951, was able to grow from a somewhat inconsequential role into the judge, jury and executioner for all matters involving collegiate athletics in America. Schooled also examines the coining of the term “student-athletes” by Walter Byers, the NCAA’s first Exec. Director, as a method of avoiding liability for either workman’s compensation or litigation brought on by the families and dependents of players. Schooled also provides a revealing analysis of the concept of “amateurism”. Specifically how it developed in 19th Century England, where it was used to prevent the lower classes from participating in organized games and athletics; how the word itself has been expunged from the Olympic Charter by the IOC since 1986, and how this “myth of amateurism” has been so well-crafted and ingrained into the minds of the American public that many see it as a symbol of “purity” lacking in the professional sports world, while millions watch and millions are made in the process. Several economists featured in the film note that the NCAA operates as a cartel (making an interesting comparison with OPEC's role in the steady rise of oil prices) and actively engages in what is essentially price-fixing (which violates both antitrust legislation as well as criminal law), in that universities and the NCAA work together to ensure no “student-athletes” are paid, thereby keeping their labor cost at $0. The opportunity to attend university and receive a college education is, for many, reason enough to justify the existing practices of the NCAA. However, this is an overly simplistic analysis of the situation. As demonstrated by the numerous revelations of academic fraud at major universities over the years, including the 2012 scandal at the University of North Carolina (which is featured in the film), the main goal of coaching staffs and athletic departments across the country is to ensure player eligibility; not the attainment of knowledge. Notable high school athletes who are clearly not ready for college-level coursework are often admitted via special exemption, without serious regard for their long-term academic development. In addition, the “student-athlete” has no security in their education due to the fact that scholarships are renewed on a yearly basis at the discretion of the coaching staff. Whether you follow college sports, economics or American business and labor laws, you will find Schooled: The Price of College Sports both informative and entertaining. The sixth installment in Alan Bradley’s award-winning Flavia De Luce series finds our heroine anxiously awaiting the return of her long absent mother, Harriet, at the train station. What she doesn’t count on is a whispered, cryptic message from a stranger who promptly ends up murdered. Flavia unravels this latest mystery with the help of some discovered film footage, a Gipsy Moth plane, and – of course - the magic of chemistry. Flavia is an engaging character, at once intensely precocious and extremely child-like. The Dead In Their Vaulted Arches has a decidedly more serious tone than the previous volumes, and it works in the overall narrative’s favor, as Flavia sorts through her feelings towards the mother she never knew while she investigates the murder of the stranger at the train station. The murder mystery definitely takes a backseat here, with Bradley spending a good deal of time sitting with Flavia and examining her doubts about herself and her family. I appreciated getting to know this more sensitive side of Flavia. I also appreciated Bradley taking the time to flesh out some of the peripheral characters, like Flavia’s father, sisters, and their faithful friend, Dogger. Bradley manages to make the De Luce family more sympathetic without compromising the sketches of personality laid out earlier in the series. Find The Dead In Their Vaulted Arches in the Library. The United States was the first country to develop nuclear weapons. It is also the only country to have ever used nuclear weapons against a foreign power. The arms race during the Cold War led America and Russia to build vast aresenals of nuclear weaponry. America currently has more than 4,500 warheads ready to launch at a moment's notice. It's estimated that Russia has more. Command and Control takes a close look at the history of these weapons and the men and women responsible for them. Last month's news reports about low morale, lapsed security and narcotics abuse at some of America's nuclear facilities got me interested in this book. Eric Schlosser gained national fame for his first book Fast Food Nation, his writing style is very approachable and informative. Anyone that liked Dr. Strangelove (how could you not?) would like Command and Control. Find Command and Control in the Library. As expected, the fiftieth anniversary of the assassination of President Kennedy saw a flood of new material published on everything from his personal life and early political career, to the presidency as well as the assassination itself. This only serves to demonstrate how unquestionably difficult it has become to find anything new to write (or read) about JFK. However, among the many titles released this year, a handful of books have approached the subject with some originality. 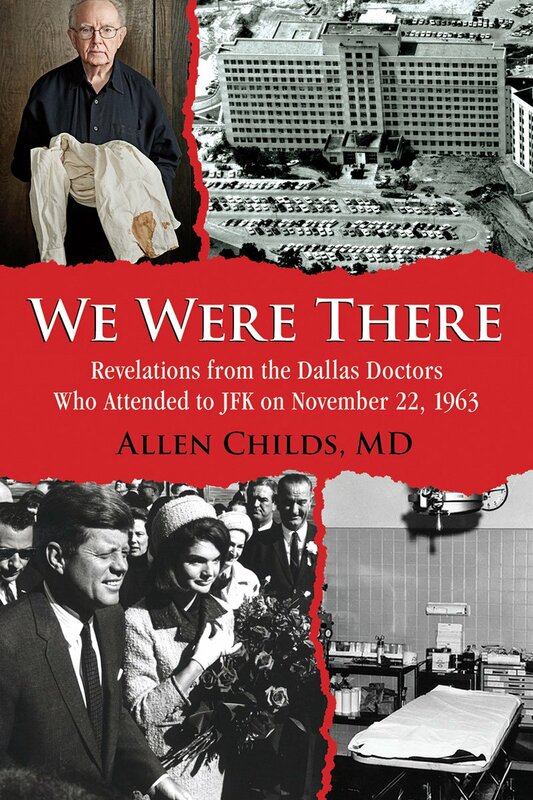 One of these is We Were There: Revelations from the Dallas Doctors who Attended to JFK on November 22, 1963, by Allen Childs, MD. Just as historian Robert Dallek provided new insight into Kennedy’s numerous medical issues in An Unfinished Life, and retired Secret Service personnel provided their own accounts of the assassination in both The Kennedy Detail as well as this year’s Five Days in November, Dr. Childs (who was at Parkland Memorial Hospital that day) utilizes Warren Commission testimonies, oral history transcripts from the Sixth Floor Museum, as well as the personal recollections of the medical staff at Parkland to provide a detailed examination of their desperate attempts to save both President Kennedy as well as his assassin, Lee Harvey Oswald, just two days later. There is a great deal of information here for both veteran JFK “buffs” as well as others who may simply be commemorating the anniversary. Some of the highlights include: JFK wearing a back brace and bandage around his lower back and pelvis for support that day; the exit wound at Kennedy’s throat being incidentally obscured by doctors as they performed a tracheotomy; the doctors being so preoccupied with the President’s other wounds, they never turned him over to see the entrance wound on his upper back (later discovered at Bethesda Naval Hospital), as well as the standoff between Dr. Earl Rose (Dallas County Medical Examiner) and Secret Service Agent Roy Kellerman over the President's body and where the autopsy would take place, which caused a break in the all important chain of custody. Although the writing can at times be a bit dry (they are doctors, after all), We Were There remains a book that clearly adds to our knowledge and understanding of the enormously significant but often overlooked events that immediately followed President Kennedy's assassination. Peace is the debut album from L.A.’s Vista Chino but the members involved are far from novices. The band is comprised of musicians who have spent at least 20 years in the underground rock scene and the album actually sounds like a hybrid of 90’s Fuzz Rock and 70’s Classic Rock. The overall production has a low fidelity feel to it which gives the recording some character though the drums suffer to a small extent from this choice. The drum tone sounds a bit stale on some tracks more than others but the actual execution of the drumming is done with great mastery by Brant Bjork who has perfected the art of “the groove” and also provides lead vocals on the first half of “Planets 1 & 2”. The very first track “Good Morning Wasteland” is merely a mock field recording with echoing, effected guitar notes that lead into the first actual full band composition “Dragona Dragona” which opens with an overly compressed distorted guitar riff that bends and mutates into multiple themes before settling on a song structure and is a clear indicator of what this band is all about. Lead single “Sweet Remain” comes out swinging with a pummeling juggernaut of a rhythmic synergy between the guitars and drums carrying some of the strongest and most caustic lead vocals on the album while the guitars on the following song “As You Wish” slither across the rhythmic framework during the verses then build momentum in the pre-chorus only to avalanche through the “hook” in a stop/start manner which perfectly resolves all tension throughout the song. Faux-closer “Acidize…The Gambling Moose” (“faux” because the record wraps up with two bonus or “encore” tracks) revs up slowly with a fuzzed out guitar riff laden with a smoother and cleaner vocal approach and runs the gamut from Space Rock to guitar Jazz then traditional Blues with accompanying harmonica for taste, finding parallels with artists such as Radiohead along the way before finally blasting into a Zeppelin-esque Blues/Rock jam session in an almost half-time feel until the end. The track lasts almost exactly 13 minutes and puts every second to impeccably good use. This record sounds huge and expansive but almost suffocating at the same time, as if it is filling not only the seemingly infinite stretch of space for miles ahead but also the space directly in front of the listener’s face. The guitars are pushed up front in the mix but not overly aggressive in style due to the swagger of the groove set by the drummer and the hypnotically rhythmic sympathetic resonance injected by guitarist Bruno Fevery who also provides some of the most technically proficient yet tunefully unique lead playing I’ve ever heard. Vocalist John Garcia still peels paint off the walls with his signature rugged, high pitched rasp but ventures into cleaner, prettier vocal territories as well which I would personally encourage him to explore further on future recordings. The album features bass guitar contributions from three different players including the band’s own drummer Bjork, Nick Oliveri (of Queens of The Stone Age, Kyuss, and Mondo Generator fame) and Mike Dean (Corrosion of Conformity) but you could hardly tell that there is more than one bass player throughout the record due to stylistic consistency. Granted the bass is not the most audibly prominent instrument for much of the album’s nearly hour long running time but it always blends in and helps set the stage for the vast expanse of the soundscape that Vista Chino is making and considering that two of the members of this band are founding members of the long-defunct “Desert Rock” powerhouse Kyuss with contributions from a third founding member, it’s no wonder the music sounds this big and is this good. Peace is easily a top five rock record for 2013 and comes highly recommended for anyone interested in hearing this type of music without the stigma of radio rock insipidity. Welcome to the new year. If you're anything like me you spent last night home alone re-watching episodes of Torchwood. If you're like most everyone else, you might have enjoyed the company of friends as well as the company that makes your favorite adult beverages. I'm sure you had fun last night, but maybe today you aren't enjoying yourself quite as much. Here some suggestions to help you feel better. All the hangover cures recommended by Salvatore Calabrese were created by the world’s leading bartenders. The book also includes the science of the hangover, and the history of hangover cures since antiquity. Natural remedies you already own that, shockingly, will make that nausea disappear. Jane Scrivner gives you permission to eat. All day. Seriously. Outerbridge provides a profusion of guidance and a little entertainment for everyone enduring the wrath of the grape. The cures range from the well tried to exotic. Delightful folksy anecdotes from country doctors are sure to make you smile as you follow practical, drug-free, country-tested remedies, including how to get rid of that hangover you can't shake. Of course you could just zone out on the couch, feeling bad with the Hangover Trilogy starring Bradley Cooper, Ed Helms and Zach Galifianakis. Part One, Part Two and Part Three are all available to put on hold at Eisenhower. "An eager young wife who had been shaped just like every other eager young wife of my generation… by her husband". The Aviator’s Wife gives a unique look through the eyes of Anne Morrow Lindbergh, wife of Charles Lindbergh. This story shows the couple’s life together from beginning to end, taking historical accounts and giving them a realistic edge. From the poignant kidnapping of their firstborn child, to the Lindberghs’ infamous involvement with the early Nazi party, readers see the oppression that Anne faces, rarely ever able to voice her thoughts and emotions to her dispassionate husband. This story truly shows the damaging effects of fame that few realize exist. I often found myself frustrated with the main character, expecting her to stand up to her husband, wondering why such a privileged woman allowed her life to veer in such a miserable direction. I understand that her position as the obedient wife is pretty typical for her time, but her thoughts were too often the opposite of what her husband expected them to be. I can only think of two times in the entire book that the character stated that she was truly happy; once when her six month trip around the world met an abrupt halt, and she was once again reunited with her firstborn child. The second was when she was in her fifties, when Anne found her own little niche in an apartment away from her now empty family home with new friends, and began an affair with a sensitive doctor. Charles was always away on trips, as he was never able to stay in one place, and Anne tended to prefer it this way. In the end, everything is tied into a neat little bow. Anne decides she does not regret the very often lonely life that she has lived as the wife of an aviator full of an insatiable wanderlust. She has finally published a great story, and people have begun to recognize and appreciate her for who she is, and not as merely an extension to her husband. The story is, however, very historically accurate, and I would recommend this book to fans of the time, the Lindbergh family, or aviation. Find The Aviator's Wife in the library. "[Getting five kids into bed] is like dealing with terrorists. You have to cajole them, and you have to negotiate ... it's really the opposite of a hostage situation — instead of trying to get people out of there, you're trying to keep them in there: I'll give you whatever you want! What do you want, a helicopter to Cuba? Anything, just stay in there and don't hurt anyone." Stand-up comedian Jim Gaffigan's first book is about parenting. It's not a how-to guide or a manual of any kind. In fact, this is the last person you'd want to be taking parenting advice from. Gaffigan doesn't know anything about being a parent. He got married and all of a sudden there were babies crawling all over his apartment. He doesn't know how it happened. Gaffigan's collection of essays is a welcome addition to the ultra-polemical barrage of parenting books that have come out in the past few years. You can tell he loves being a parent, even if it means he never sleeps again, loses touch with friends, and feeling guilty about every decision he makes. He narrated this book and I highly recommend listening to it. He has a midwestern deadpan delivery that will make you laugh out loud (but not too loud because the kids are sleeping). Find Dad is Fat at the library. Can great performances save a movie? In lesser hands, the dialogue in Ridley Scott’s The Counselor would have been painful. Imagine the film’s writer, Cormac McCarthy, channeling Paulo Coelho. Every line a t-shirt slogan. Michael Fassbender is masterful as the counselor, wending his way through the dark world of drug trafficking. Can anybody around today do crazy better than Javier Bardem? Cameron Diaz is at her uninhibited best as she reveals her leopard’s spots. I could write more but I have calls to make and I might have time for a short nap. Find the film's screenplay in the library.